The natural choice for finer-quality and greater attention to detail then, is to support the independent makers who are going to great lengths to ensure the fiber content and care in craftsmanship is in keeping with best consumer protection practices. 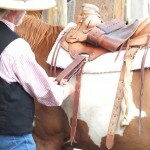 Many of these ‘local’ cinch makers are investing heavily in education and materials which are not yet found in commercial hobby and craft supply stores. A precious few makers are even stepping back in the process to twist their own cordage and detailing yarns to gain increased confidence and consistency of fiber content and handling/end-use performance. The latter group, of course, are adding multiple times the number of hours to their production and thus should be supported in the proportionately higher prices they command. Since a good number of these independent makers are going well beyond the expected ‘labor’ to provide the exceptional, we do encourage the public to honor the value they place on their time and recognize that truly calculating all time required would likely increase the retail value multiple times. Along those lines (just a thought here on how makers might be encouraged to go even further with design and refinement of materials used) you might consider TIPPING your maker. 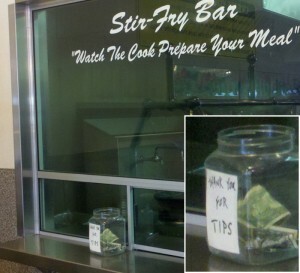 After all since the guy at the Stir-Fri window gets tips for simply doing his job, you would really make the day for your maker who is already going beyond the expected! To those who are most familiar with fibers and how they perform, mohair is the most obvious cinch material being abused and devalued by the counterfeiting that results from false labeling. Other materials are also being promoted in unfortunate manners which further confuse consumers and often resulting in pressuring accurately labeled articles off the market. 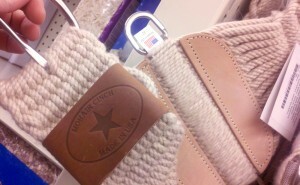 In many cases, especially with cinches, individuals dedicated to correct promotion and labeling are discouraged from publishing sustainable selling prices because of the consumer pressures which result from misconceptions of value. 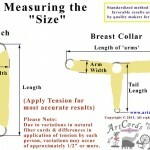 Rather than questioning and degrading the premium values determined by confident, independent makers, it may be more beneficial to scrutinize the unreasonably low pricing which often does not compute when recognizing the skill, time, and materials required even for the simplest synthetic cinches. While some commercial business owners have found it less stressful to pursue other, more profitable avenues of work than bend to the market pressures which seem to applaud and reward the “sounds good” labeling even when it is misleading, others choose to maintain a living at a good paying ‘career’ or ‘comfortable’ retirement check and use cinch making as a hobby with little or no calculation of value on their time. Most of those hobbyist pay the same or slightly more than the volume producers pay for the most available, factory twisted cords as there has been no suggested retail price determined by the production factory. 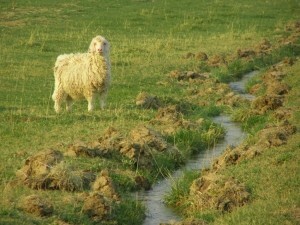 Those who have chosen the high road of ensuring they have known fiber contents by acquiring specifically labeled fibers or direct from the fiber breeders requiring custom yarn spinning, either by hand, or mill spun, have so many more levels of expense with clear need for wholesale and retail values to ensure sustainability through coverage of market cost increases. 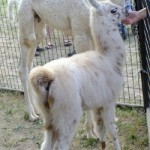 An angora goat, the source of Mohair. You need not be a rocket scientist to understand the challenge and value of natural fiber cords. Just search around for natural fiber yarns that are sold for knitting or crocheting. Since the fine animal hairs are more difficult to process, easily resulting in 30% to over 60% loss of fiber before spinning, and require slower spinning equipment speeds, most mills simply refuse to handle natural fibers without mixing in 30% or more of sheep wool and/or synthetics. 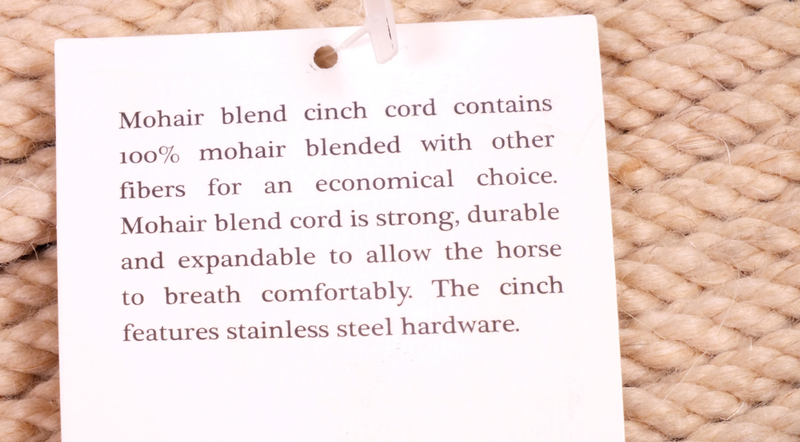 As you look for those natural fiber yarns, it is good to note how specifically they are advertised and labeled. 100% Rayon bar on a common “Mohair Blend” cinch… How important do you think disclosure of the rayon should be? no specialty fiber is otherwise identified, may contain one or many natural animal fibers. However, as soon as a content fiber other than wool is used to promote the product through advertising and/or labeling, all fiber contents must be disclosed with accurate percentages. Only a 3% variance is allowed as acceptable for unintended content fluctuations of manufacturing. When advertised with “100%”, “All” or “Pure”, absolutely no unintended content is legally acceptable. 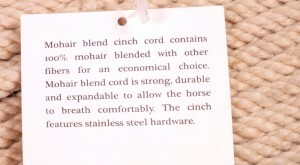 These are guidelines designed for consumer protection, and if these requirements along with standard mark-ups to determine retail value for sustainability were being followed by even half of today’s cinch industry, consumers would have a much more accurate perspective of fiber contents, value, and could more easily distinguish many of the reasons for painful cinch sores. 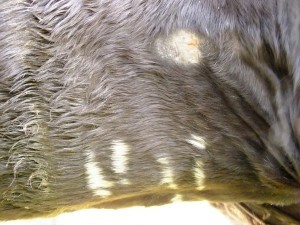 The sensitive skin of this ‘cinchy’ Arabian shows signs of pressure damage from cinches bunching up… such folds along the sternum have been found to produce pressures in excess of 50 psi. As part of our dedication to principle based education. 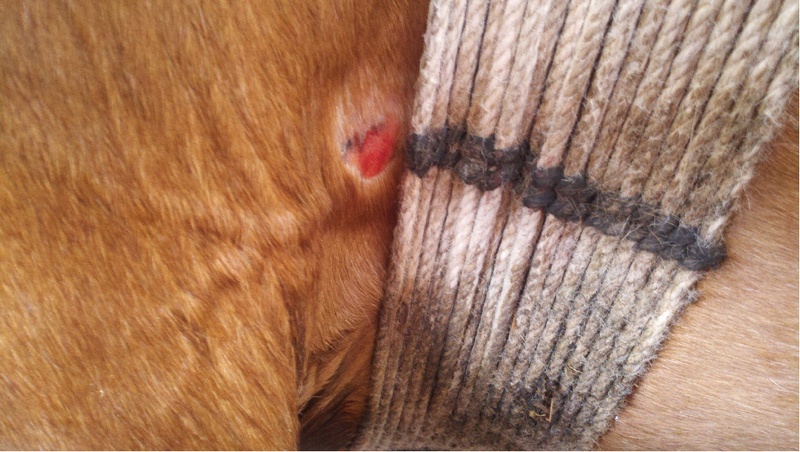 We have begun collecting photos of cinch problems with information about the cinches themselves and the riding conditions the problems were discovered. This collection process along with direct scientific research on the most popular materials and styles compared to traditional designs and natural fibers will go along way toward identifying common threads and reasons for change if determined necessary. We appreciate your support in this sizable task, both in terms of funding and word-of-mouth promotion. The more of us who chip in to learn about how the cinch really works, the sooner and more consistently will our horses and mules breath easier with increased comfort and enjoyment.